A Circuit Diagram is the key! How can a circuit diagram be a key, it's just a load of funny squiggles isn't it? Yes it is to the non-technical person, but to a technical person, a circuit or schematic diagram is very much a key to the equipment concerned. You could call the schematic diagram the coded key to the pulse of life in any piece of equipment, big or small. Squiggles they may be but without it, to those who understand how to read them, repairing equipment can be very much more difficult, if not nearly impossible. A circuit diagram also called an electronic or electrical diagram, wiring schematic or electronic schematic is a simplified graphical representation of an electrical and/or circuit. They show the actual components that make up the circuit as a set of simplified graphic type symbols, also it shows the signal and power connections between the components. 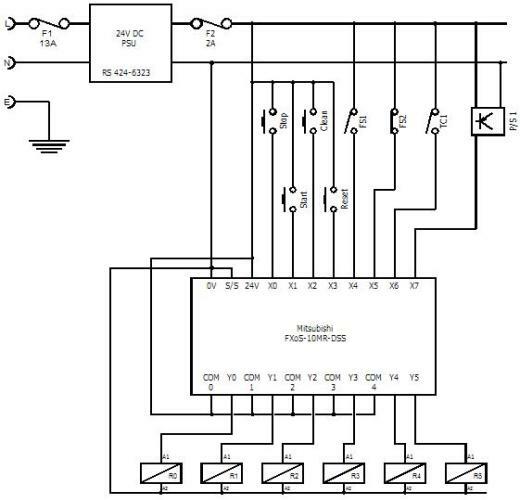 The circuit diagram above is quite a typical PLC circuit arrangement. This PLC is powered by 24V DC, hence the PSU in the top left corner, F1 (Fuse) is the mains fuse and is there to protect the PSU and wiring supplying it. F2 (2A) is the 24V DC fuse and is there to protect the wiring and the PLC, you'll notice this line connects to the 24V terminal on the PLC. You'll also notice the 0V connection on the PLC, this is the return line or common. Conventional electron (electricity) flow is from positive (+24V) to negative (0V or Common). So following this power going out through switches etc returns on the 0V or common line, generally depicted as 'Com'. The arrangement of these components within the diagram does not correspond to their physical dimensions or layout arrangement on the printed circuit board (PCB) or internal arrangement of the finished device. And it is not meant to. A schematic diagram differs from a block diagram or overview diagram in as much that it is a diagram of the actual wired connections of the circuit being described. A circuit drawing is meant to show the actual physical wired connections and the components of the electronic "physical design". Circuit schematic diagrams are also used to generate the PCB design and lend alot to the electrical layout and construction of a circuit. They are also invaluable for the fault finding and maintenance of electrical and electronic equipment. But, to read them is like learning a new language, but even for the fluent in electronic speak, sometimes they're not always easy to follow. I know what you're probably thinking, why are they drawn like that. Is it deliberate to confuse people, or is there a real reason. You know what! There is a very real reason and basically it's done to make a universal standard of electrical, electronic, mechanical, pneumatic and hydraulic symbols for drawing circuit diagrams. The electrical diagram or electronic schematic is a method of drawing a simplified representation of an electrical or electronic circuit of the equipment in question. The reason to standardise the the symbols is to aid description/recognition of how the equipment operates, or is supposed to operate in the case of fault finding. Although electrical and electronic circuit symbols have changed over the years, they also differ from country to country. Not differing so much that they would be undefinable though, they have remained basically the same, just some subtle changes. Much the same as the differences from country to country using the same standard. There is a standard that most companies follow and follow well. The drawing of components within the standard does change a little from country to country but with a little exposure to electronics this should not be of great concern. The circuit diagram shows the signals and power connections between all the individual components involved in the operation of any given piece of equipment. Most circuit diagrams are drawn following the powerflow. This means going from the power supply, to the higher power components, then the lower power components and following that, switches and sensors involved in the operation of the equipment. Then after that, things like volt free contacts giving condition indications to other equipment that may be driven or monitoring. The schematic does not generally give any real indication as to the physical layout of the individual component parts within it's guts or under the covers. But this is not always the case, sometimes it amkes sense to be drawn like that. The way the equipment operates hardly ever relates to its physical layout. Circuit diagrams are primarily for the design and maintenance of electronic, electrical, pneumatic and hydraulic equipment. Electro-mechanical parts are quite often used in machinery and the like and is more prone to failure than just electronic based equipment. To this ends a circuit is invaluable to the engineer or technician undertaking it's fault finding and repair, yes I'm speaking from a great number of years of experience here. Symbol standards used are either the ANSI standard Y32 or the IEC standard 617. Different symbols are often used depending on the subject of the actual drawing concerned. For an example, lighting and power symbols used in an architects drawings may well be different from symbols for similar devices used in electronics.